Sign Up For Our Next Free Weather Spotter Class! The Spring 2019 Edition Of Our Newsletter, Carolina Skywatcher, Is Now Online! The Monthly Climate Review for March 2019 is now online! Hurricane Fran developed from a tropical wave that moved off the coast of Africa on August 22nd. It followed closely behind a powerful Hurricane Edouard which prevented Fran from quickly developing early on. Eventually, Edouard would move far enough out to sea to allow Fran to develop into a powerful Category 3 hurricane before making landfall on the southeast North Carolina coast (Fig. 1). Figure 1: Track of Hurricane Fran (Coastal Services Center). 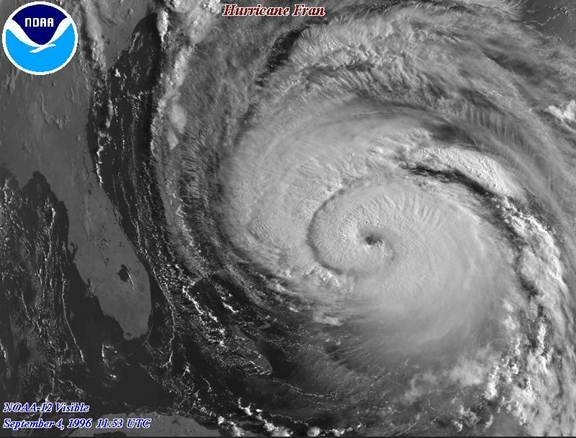 Fran was the second hurricane to slam into the North Carolina coast in the same season. 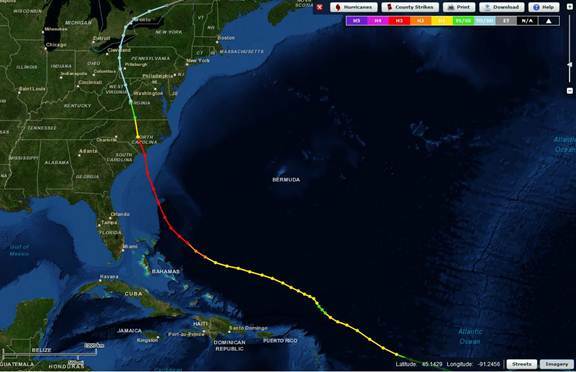 Bertha was a Category 2 hurricane when she hit just two months earlier. There wasn’t much time to recover from the first disaster before the second hit. Fran caused major flooding from North Carolina to Maryland and West Virginia. The damage from Fran was so extensive that the name “Fran” was removed from the hurricane name list and replaced by Fay. Hurricane Fran formed from a tropical wave that moved off the African coast on August 22nd. Around 8 a.m. August 23rd, ship reports confirmed that the circulation had reached the surface, making it a tropical depression just southeast of the Cape Verde Islands. Over the next few days, the depression progressed on a west-northwesterly track at about 17 mph. No significant development had occurred until the morning of the 27th when the depression was upgraded to Tropical Storm Fran. This was likely due to the fact that the storm was following the path of a powerful Hurricane Edouard, which was located about 865 miles to the west-northwest. Fran continued to follow behind Edouard and reached hurricane status the evening of the 28th. By the morning of the 30th, Fran was located about 175 miles northeast of the Leeward Islands. On the same day, Fran had weakened to just below hurricane status, probably a result of interaction from Edouard again. This caused Fran to take a more northwesterly track and slow to about 5 mph. By the next morning, Edouard would be far enough away for Fran to regain hurricane status. During this time the subtropical ridge became well established, acting as a conveyor belt for Fran to pick up speed and resume the west-northwest motion over the next few days. As this motion continued, Fran paralleled the Bahamas with the eye remaining just over 115 miles to the northeast of the islands (Fig. 2). 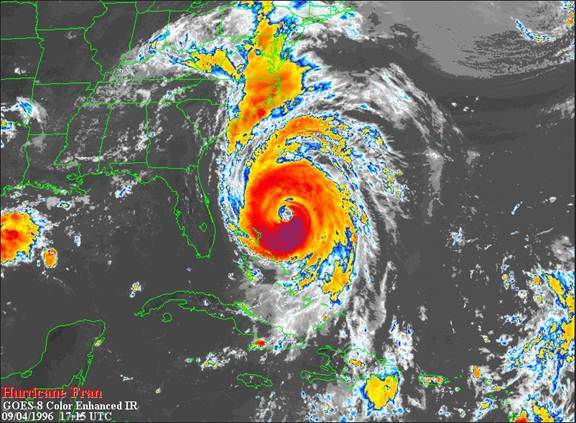 Once Fran was northeast of the Bahamas, she reached Category 3 hurricane status (Fig. 3). Around 8 p.m. September 4th, Fran reached its peak intensity with sustained winds of 120 mph and a minimum pressure of 946 mb. Due to a low pressure centered over Tennessee and the western extension of the subtropical ridge over the northwest Atlantic, Fran was steered onto a north-northwesterly track and gained speed. Moving around 17 mph, the center of Fran made landfall over the Cape Fear area on September 5th around 8:30 p.m., just southwest of Wilmington, North Carolina (Fig. 4). At landfall, sustained winds were 115 mph and the minimum pressure was 954 mb. Within six hours of landfall, the powerful category 3 storm had quickly weakened to a category 1. And after another twelve hours, the storm was downgraded to a depression after moving over Virginia. Fran continued on its north-northwest track, losing its tropical characteristics while it moved over the eastern Great Lakes. After it lost its warm core, Fran was declared non-tropical by 8 p.m. September 8th while it was centered over southern Ontario. Eventually the remnants of Fran were absorbed into a frontal system around 2 a.m. on the 10th. Fran caused widespread damage from South Carolina to Ohio, including Maryland and Pennsylvania. The most significant damage occurred in North Carolina, but record flooding occurred in some states, while the highest rainfall measurement occurred in northern Virginia (Fig. 5). Starting in Florida, large swells caused a ship to capsize throwing its crew overboard. Everyone was rescued without incident. South Carolina experienced extensive agricultural damage due to the high winds and heavy rains. An estimated $15 million was lost due to evacuation of tourists and residents. Overall, roughly $48.5 million in damage occurred in South Carolina. North Carolina got the worst of the storm, and therefore experienced the worst of the damage. The highest wind gust of 137 mph occurred in the northeast quadrant of the hurricane: Wilmington, NC. The North Topsail Beach police station was washed away by a 12 foot storm surge. The police station was being temporarily housed in a double wide since Bertha wiped out the original building just a few months prior. Kure Beach Pier was destroyed along with the Emerald Isle fishing pier, while Bogue Inlet Pier lost 150 feet. 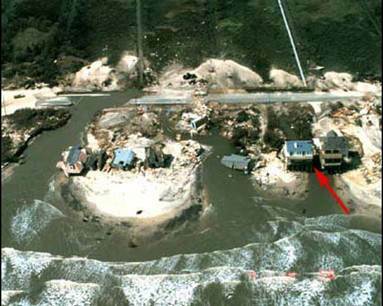 Storm surge in North Topsail Beach created a 100-foot wide inlet. Topsail Island lost 40 feet of beach due to erosion. This also caused numerous houses to be destroyed. Swansboro and Newbern experienced 10 feet of storm surge, causing many waterfront businesses to be flooded and/or destroyed. Over 400 homes in Emerald Isle were damaged with about 60 being completely destroyed. Dune erosion ranged from 5-20 feet up and down the North Carolina coast. Damages in North Topsail Beach and Carteret County alone were estimated to be over $500 million (Fig. 6). 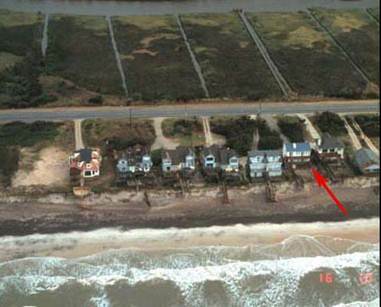 Figure 6: Before (left) and after (right) images of homes damaged along North Topsail Beach (ECU). Hurricane force wind gusts were experienced as far inland as Raleigh. High winds damaged historical buildings. Classes at the University of North Carolina were canceled for a day and it was almost a week before the water was drinkable again. Strong winds and a saturated ground led to many trees being uprooted inland. This led to numerous houses being destroyed by trees falling on them. Over a million people were left without power. Almost two weeks after the storm, 150 secondary roads were still closed due to flooding and downed trees. Out of the 26 deaths caused by Fran, 14 occurred in North Carolina. Most of them were caused by accidents from fallen trees, including trees falling on houses and automobile crashes into fallen trees. Total insured losses were estimated to be about $1.275 billion. Virginia’s damage totals were mostly from fallen trees and power lines and flooding. Over 400,000 people were without power. Sixteen inches of rain was measured in Big Meadows located in northern Virginia. Floods shut down many primary and secondary roads. Even Shenandoah National Park had to close for a while due to heavy rains and flooding. Nearly 300 homes were destroyed by flooding and some 100 people had to be rescued from flood waters. All rivers in central Virginia experienced flood stage with some setting record level flood heights. Numerous counties in western and central Virginia reported damages of over $1 million. Maryland, Pennsylvania, and West Virginia also experienced damage due to flash flooding from heavy rain fall. Far eastern portions of West Virginia reported upwards of fourteen inches of rain while Pennsylvania ranged from one inch in the northern areas to six inches across southern portions of the state. Ohio was lucky and only experienced damage from small stream flooding and localized street flooding. Ohio was pretty dry prior to Fran, so the larger rivers welcomed the extreme rainfall. 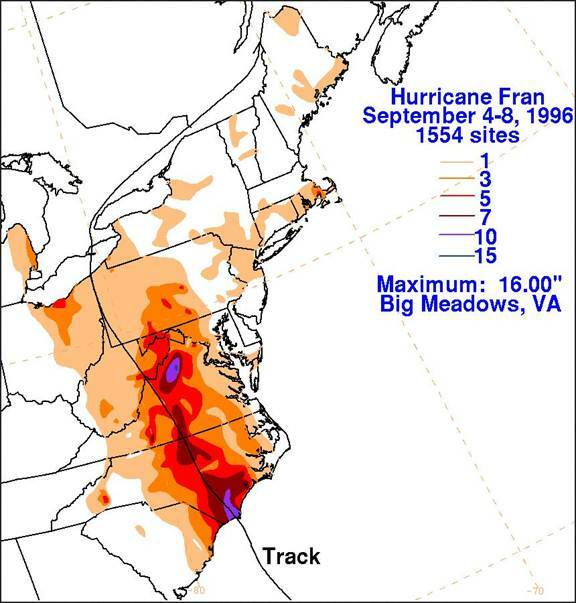 In summary, Hurricane Fran left her mark on the United States, especially on North Carolina. 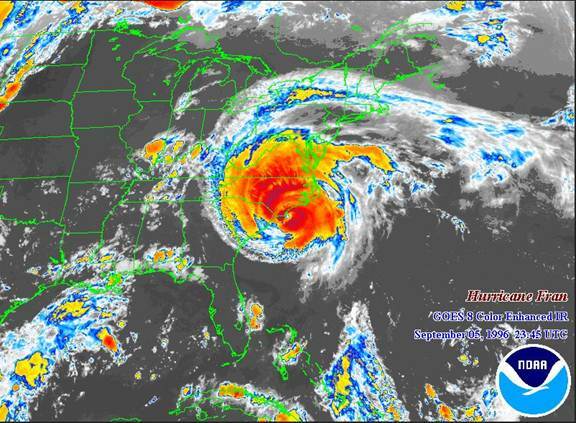 It was the second hurricane to hit the North Carolina coast in the same year; Bertha was a Category 2 when she made landfall just two months earlier. Due to the extensive damage in North Carolina, the name Fran was retired from the hurricane name list.